The following paper will discuss the dynamics of structured image framework theory (SIFT) and how the model directly corresponds to known brain structures. SIFT allows clients to understand both how they process everyday emotions and heightened emotional distress and how that emotional distress corresponds to and mirrors recent neurological understanding of how the brain operates. The SIFT model has been developed from thousands of client descriptions of clinical treatment over the past 25 years—from childhood dynamics, a variety of psychopathologies, community settings, and disasters through to war-service adjustment. SIFT enables the client and the therapist to use a structure that can be flexibly applied to a variety of emotionally distressing processes. The SIFT base model enables the therapist to clearly describe brain structures and functions that correspond to an applied diagram. The SIFT diagrammatic structure highlights what clients have experienced during typical or difficult emotional processing situations. This encourages normalization, initiates adaptive processing mechanisms, and secures a stronger therapeutic alliance in a timely fashion, which increases positive therapeutic outcomes. This paper presents the broad structures of a therapeutic framework that describes the dynamics of emotional processing. The resulting therapeutic guidelines and descriptions of the structured image framework theory (SIFT) model have been tested and formulated from a wide range of therapeutic interventions across multiple dimensions of emotional experience reported by clients over 25 years of psychological treatment. To understand how a person processes various emotionally distressing experiences and how exposure to such experiences can affect a person’s day-to-day functioning is a complex challenge. This understanding can be achieved by various therapeutic techniques that aim to reassure the client with a sense of personal safety and control. The better clients can understand how they have been emotionally impacted from an experience and how they can expect to adjust through predictable processing systems, the better they can develop, grow and adapt to their environment. As has been shown within the field of psychotherapy, it is vital to promote an expectation that a client can change their emotional discomfort and potentially developed psychopathology to a more positive adaptive thriving state (Prochaska, 1984). Therapy should promote positive change. The SIFT model encourages the client to have conscious experiential feedback through cathartic corrective emotional experiences, self-liberation, counter-conditioning, and re-evaluation processes (Prochaska, 1984). Neuropsychotherapy emphasizes aspects of how the brain’s functions can be shown to foster change and healing through therapy. Under the therapist’s guidance, neuropsychotherapy should emphasize how the client’s own brain is processing information. Ideally, therapy should promote the power of a person’s own brain and facilitate its capacity to take over and thrive from a stuck point in processing following a significant emotional impact (Shapiro, 2012). The principles of how the brain can change itself through significant emotional experiences are vital for promoting individual growth. The fact that neuroplasticity reveals how our brains are self-changing, and that they develop structures unique to the individual and continue to change throughout our lives, gives the therapist and client great hope. Unfortunately, neuroplasticity not only makes our brain more resourceful but also more malleable to outside environmental influences that can lead to maladaptive psychopathology if not guided effectively by the support of others (Doidge, 2007). The difficulty of encouraging the therapist to have a greater capacity to navigate and moderate a client’s emotional distress within felt controlled parameters during treatment remains the challenge. A better understanding of how the brain functions in times of emotional distress can improve the capacity of the therapist and client to control emotional disturbance and promote healthy personal growth (Rossouw, 2014). As with any sound theoretical framework (Hjelle & Ziegler, 1992), SIFT explains how a person experiencing multiple emotionally disturbing situations can potentially develop maladaptive adjustment. SIFT works within clear and explicitly defined concepts that can logically generate testable predictions for both therapist and client: It enables the therapist to explore a variety of distressing experiences that can cause negative pain cycles, catastrophic thought patterns, anxiety, post-traumatic stress disorder, complicated grief, depression, inconsistent performance, and reduced resilience to cope with adversity in their clients. The SIFT diagrammatic structure illustrates how a broad range of emotional experiences can affect the client. SIFT does this in an internally consistent manner and also encompasses a diverse range of behavioral shifts that may be associated with distress throughout life (Hjelle & Ziegler, 1992). An important aim of the model is to show how the challenges we face can be represented to the client so that he/she understands how emotionally distressing information is typically processed. SIFT has been formulated to increase the ways in which a client can understand the dynamics involved in everyday emotional processing and potentially in the development of non-adaptive psychopathology disorders. The SIFT model has been designed primarily to enable the counselling clinician to facilitate long-term recovery and promote positive personal growth in a client who is having trouble adjusting to life’s challenges (Bouda & Diver, 2012). Van der Kolk’s (1994) schematic representation of the effects of emotional arousal on declarative memory showed how explanatory models can give the client and clinician a greater applied understanding of trauma processing. Therefore, it is preferable that an applied model should be concise, clear, and flexible. The SIFT model enables a client after suffering trauma to understand their current psychological state and encourage proactive self-management strategies in the future. One of the fundamental factors for someone experiencing psychological distress during a forced time of adaptation is an overwhelming sense of personal loss of control. As Pieter Rossouw (2014) made clear in his integrated model of neuropsychotherapy, a sense of personal safety with enriched environmental triggers promotes a greater capacity to approach higher order constructs and better attachment to others, which in turn develops a greater sense of self. If, on the other hand, there are compromised environmental triggers, these factors can be hampered or promote avoidance and feelings of being unsafe (Rossouw, 2014). If safety is compromised within the clinical treatment session, it can be detrimental to use a bottom-up/top-down therapeutic approach with a client who lacks a full understanding of how they arrived at their heightened emotional state. This is where SIFT is invaluable in enabling a person to understand how environmental stimuli and activated memories are processed in a framework that mirrors multiple dynamics of brain function during treatment (Wilson, 2014). The following developed SIFT model (Figure 1) enables clinicians and their clients to understand the processes that are involved in adapting to everyday emotional processing as well as complex and overwhelming environmental stimuli that are within or beyond a person’s current adaptive capabilities. Figure 1. Structured image framework theory (SIFT): Base model. Copyright by Clear View Psychology Services Pty Ltd. Initial storage area (ISA)—the ISA filter. As shown in Figure 1, the ISA filter represents to the client the access point where environmental information from all senses is initially processed according to a person’s established belief structures. The Î’s across the filter structure in Figure 1 represent the linkage between the Î’s in the central part of the emotional processing area (EPA) and the connecting lines of the established belief structures, which access the long-term storage area (LTSA). The ISA filter shows how, if a person wants to accept information because they are familiar with the presenting information, or have enriched environmental triggers or stimuli (Rossouw, 2014), he or she will accept emotionally based information into the ISA structure. If, however, the ISA filter finds the environmental information irrelevant or compromising to the client’s world view (i.e., a summary of one’s individually developed belief structures), the client will either reject, or ignore, or not notice the information presented for everyday emotional processing. If danger or life threat is perceived, the ISA filter will shut down and endangering environmental stimuli will rapidly be absorbed into the ISA. Initial storage area (ISA). 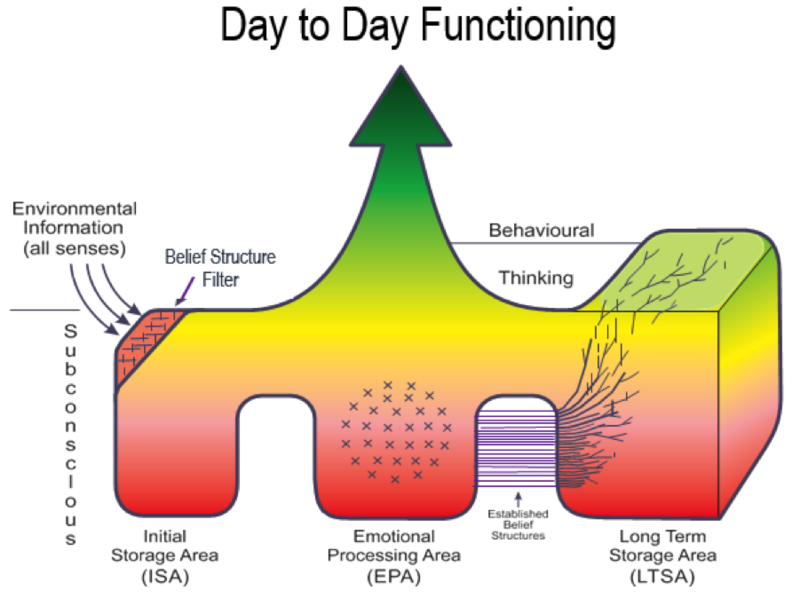 As shown in Figure 1, everyday emotionally based stimuli are processed through the ISA filter, which influences what is accepted into or rejected by the ISA. Once stimuli are accepted as important by a person’s individual belief system filter, they are processed beyond this area for immediate day-to-day functioning or rehearsal for future use in the LTSA. This immediate day-to-day functioning and information rehearsal allows labelling of the accepted emotional content by the emotional labelling points (depicted by Î’s in the ISA filter and EPA) to be processed into the LTSA. This process also allows the emotionally based environmental stimuli to be labelled in a positive or negative emotional orientation, according to an individual’s previously reinforced personal belief structures. The established belief structures are individually and uniquely developed from a person’s ongoing experiences and long-term understanding of their internally perceived world view from memories held in the LTSA. Emotional processing area (EPA). The EPA is situated between the ISA and the LTSA structures. The primary function of this area is to label and encode incoming environmental stimuli and recalled memories according to a person’s previously established belief structures. It also facilitates immediate emotional responses and enables rehearsal to take place. This emotional content rehearsal allows the individual to continuously update and modify their already personally held belief structures. Because the EPA is a temporary and central processing area between ISA and the LTSA structures, it is vital for the client to understand this area within the theoretical understanding of the SIFT model. As Figure 1 shows, this area is linked to actioning established belief structure threads that enable new stimuli and existing memories to be encoded or modified according to a person’s previous experience base before they are used in day-to-day functioning. The SIFT model also describes how, once environmental stimuli have been accepted through the belief structure filter into the ISA, the selected stimuli are emotionally labelled via the EPA and immediately used in day-to-day functioning. The EPA emotional labelling points (illustrated by Î’s in the belief structure filter and EPA) are held in place by formed, developed, individually established belief structure threads emanating from learned experiences and memories held in the LTSA. Long-term storage area (LTSA). The SIFT model also describes how the EPA confirms recalled memories from the LTSA when called upon for day-to-day cognitive and behavioral functioning. The emotional labelling points (depicted by Î’s draw from an individual’s previously established belief systems to confirm recalled positive or negative long-term memories. Without this confirming process, new emotional experiences cannot be influenced by already established personal belief constructs. The process allows recalled associated (reinforcing or denying) memories to be continuously reinforced or modified according to new emotional experiences and currently held personal belief structures. The client’s established belief structures are developed through ongoing environmental stimuli, being reinforced, rewarded or negatively highlighted and encoded through long- term emotional processes over many years of development. Figure 1 shows how, once environmental stimuli/information have been influenced or encoded by the central emotional processing (which is connected to a person’s established belief structures), they think, behave and function in an individually developed and unique way. A person’s day-to-day functioning is individually modified in a positively or negatively orientated way according to their uniquely developed and established belief structures. 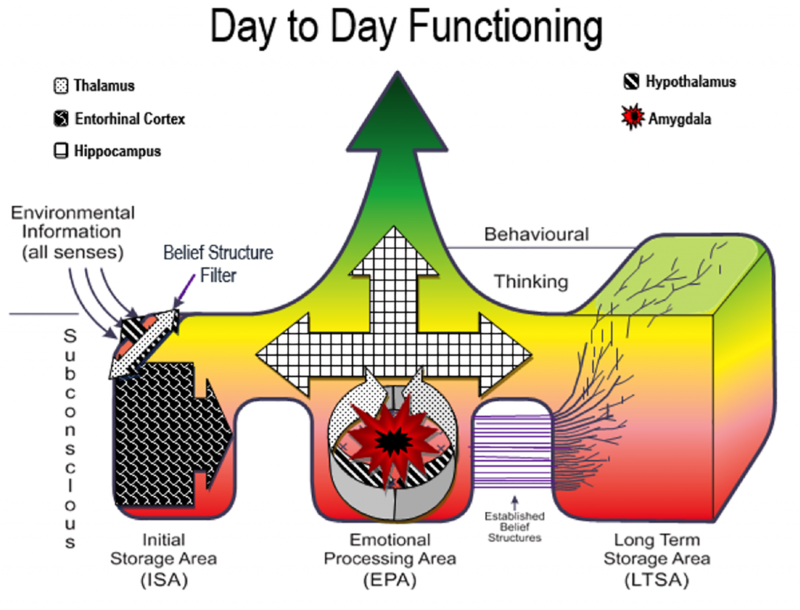 In summary, the SIFT’s theoretical framework aims to describe how everyday emotional stimuli and memories are processed at a subconscious level for day-to-day functioning via the central structure of the EPA. The advantage of SIFT is that a client can have a therapeutic and neurological theoretical framework that expansively describes the dynamics of emotional processing. SIFT also enables therapy to highlight how established belief structures develop in a stable, predictable, and organized fashion. The SIFT model has multiple developed structures that can best describe how a client experiences an emotional event. It is designed as an inclusive model that allows the clinician to work within a variety of short- and long-term clinically appropriate interventions to promote the best therapeutic outcomes for the client. SIFT facilitates ways that, over time, will enable a child, adolescent, or adult in a nurturing and supportive environment to develop positively oriented long-term memory structures that promote approaching and learning from their life experiences. Alternatively, individuals who are exposed to threatening or restricted, isolating or withdrawn environments may develop negatively oriented memory structures that promote avoidant, withdrawn, and protective behavioral patterns (Rossouw, 2014). The following diagram (Figure 2) illustrates the structures of the brain that correspond to the SIFT base model according to neuroscience and how everyday emotional experiences, significant life events, and devastating life-threatening trauma are processed (Arden & Linford, 2009; Carter, 2009). Figure 2. Brain structures that correspond to the SIFT base model. Thalamus. SIFT’s belief structure filter (i.e., the thalamus) interacts with and has several actions that correspond to the SIFT base model, as shown in Figure 3. The following highlights how the thalamus is involved in gathering environmental information and relaying stimuli to multiple brain structures. The thalamus has been described as the “relay station” for incoming information from the outside world to the cerebral cortex; it regulates brain-wave activity (plays a role in sleep and appetite) and is the starting point for all activity triggered by an external stimulus (Arden & Linford, 2009; Carter, 2009). Seeing: Light-sensitive retinal cells fire and send signals along their axons, which are bundled together to form the optic nerve. The nerve crosses at the optic chiasm where the nerve fibres connect with a specialised part of the thalamus. Hearing: Nerve impulses are received and processed by specialised neurons in the medial geniculate nucleus of the thalamus. These signals are then sent to the primary auditory cortex, which also feeds information back to the thalamus. Sound enters the ears and travels via the brainstem and thalamus to the auditory cortex. Here sound is processed by associated areas, such as Wernicke’s area, which is involved with interpreting speech. Touch: From the spinal cord the signal travels through the brain stem, crossing over to the other side of the brain. Here, the nerve fibre connects with a third-order neuron in the thalamus where the signal is relayed to the somatosensory cortex to be processed. Nuclei in the dorsal spinal column and thalamus also process sensory impulses en route. Taste: Taste and smell are both chemical senses. Receptors in the nose and mouth bind to incoming molecules, generating electrical signals to send to the brain. Both sets of signals pass along the cranial nerves. The pathway of taste related data travels from the mouth along branches of the trigeminal and glossopharyngeal nerves of the medulla, continues to the thalamus, then to primary gustatory areas of the cerebral cortex. Note: Taste has a survival value, like smell, which allows animals to evaluate and recognise what we can potentially eat or drink. It appears the more poisonous substances tend to taste bad (bitter), while those substances that are nourishing taste pleasurable or pleasant (sweet or savoury). Smell: Only has a combined amplifying role via the thalamus to enhance the processing of taste. Signals from olfactory bulbs pass along the olfactory tract to the olfactory cortex. The olfactory cortex processes signals from the olfactory bulb and relays them to the orbitofrontal cortex and the amygdala (if odour indicates danger/life threat or emotional fear). Entorhinal cortex. 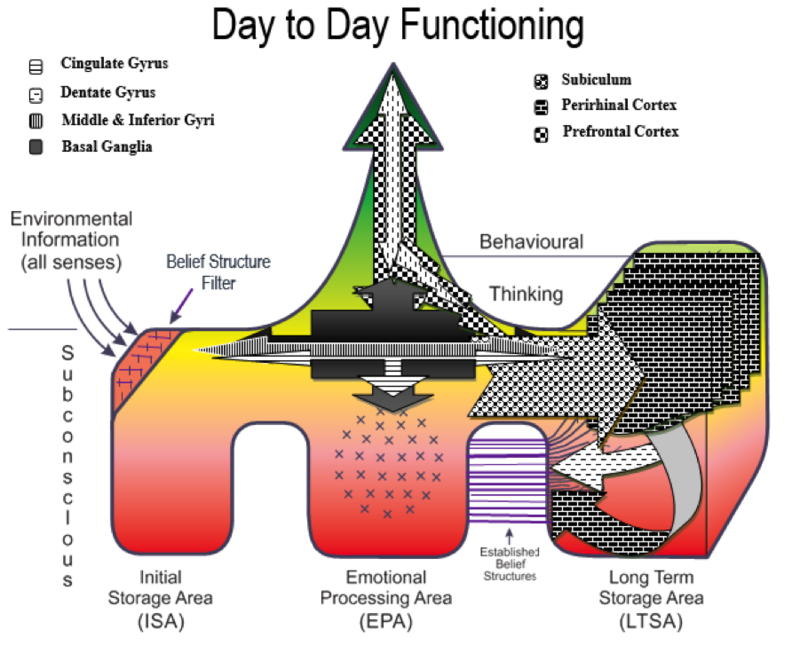 SIFT’s ISA structure (i.e., the entorhinal cortex) shows where initial environmental information is temporarily stored and prepared for further processing that leads into the central emotional processing area. The ISA allows environmental stimuli from all senses to be primed or pre-processed for further encoding, reinforcement, and action according to a person’s understanding of the world via their established belief structures. The entorhinal cortex plays a major role in memory formation. Two major connections from the lateral and medial areas provide the main input to the hippocampus. They are important to pre-processing memorable information. The lateral input stream is thought to convey spatial information to the hippocampus, while the medial input stream conveys nonspatial information. The stream of information from the entorhinal cortex through the dentate gyrus to the hippocampus is called the perforant path (Deshmukh & Knierim, 2011). It is associated with declarative and spatial memory and self-localization. A study by Shaw et al. (2007) found that in children with an increased genetic risk of developing Alzheimer’s disease, the entorhinal cortex was significantly thinner. Neuroimaging studies show that the entorhinal cortex is one of the first areas of the brain to have substantial shrinkage in patients with very mild symptoms of Alzheimer’s disease (Fischl et al, 2009). Thalamus, hypothalamus, and amygdala. Figure 3 highlights how the SIFT base model effectively depicts where the hippocampus, hypothalamus, and amygdala interact during emotional processing. Figure 3. 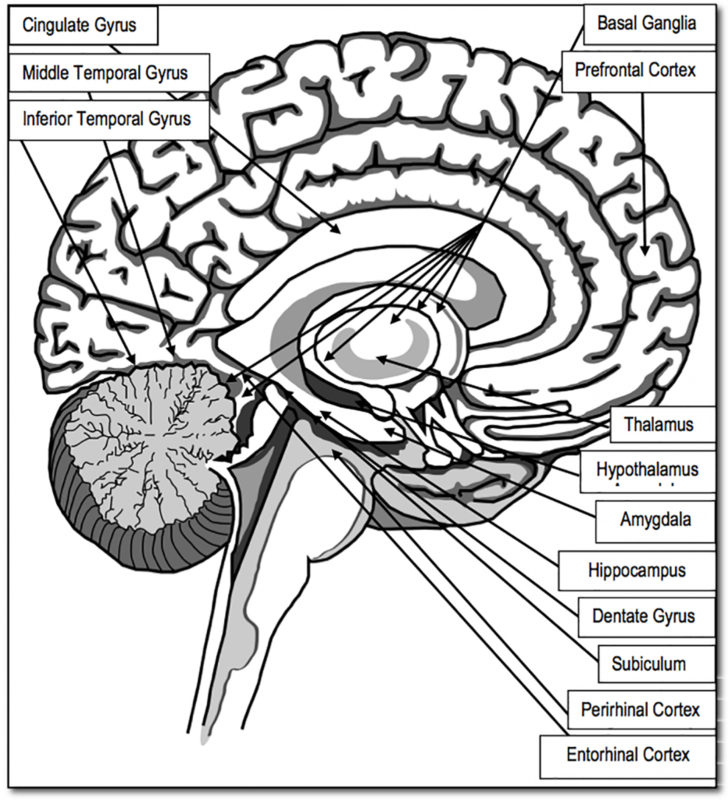 SIFT base model corresponding to the functions of the thalamus, entorhinal cortex, hippocampus, hypothalamus and amygdala. Copyright by Clear View Psychology Services Pty Ltd. The hippocampus enables central emotional processing for immediate thinking as well as encoding for long-term memory formation and establishing belief structure development, which feeds back and influences future emotional processing. The hypothalamus is shown to surround and influence the amygdala if danger is sensed or identified at the belief structure filter. The hypothalamus initiates the stress response, prepares the body to handle stressful events (fight/flight/freeze), and monitors and controls internal systems (sleep, circadian rhythm, appetite, thirst). The hypothalamus produces the stress chemical CRF (corticotropin-releasing factor). Overactivity with too much stress response can create disproportionate anxiety (Rossouw, 2014). The amygdala collects all sensory data via the thalamus (except olfactory), has a major role in the brain’s early-warning system, is constantly aware of changes in the external environment, including possible danger (Berretta, 2005; Phan, Fitzgerald, Nathan, & Tancer, 2006). Cingulate gyrus, dentate gyrus, middle and inferior temporal gyri, basal ganglia, subiculum—perirhinal cortex and prefrontal cortex. Figure 4 shows how these brain structures are involved in bottom-up and top-down thinking processes, action, and behavior. It also illustrates how day-to-day interaction and functioning encourages long-term memory formation. The rehearsal and consolidation process of emotional information towards higher executive functioning, use of imagery and symbolic encoding form memories into the LTSA. It shows how SIFT corresponds with the emotional processing, encoding, and long-term storage of information that promotes the establishment of individually based belief structures for future encoding, action, and interpretation of our world. Figure 4 highlights how the SIFT base model effectively depicts where the basal ganglia, subiculum, perirhinal cortex, and prefrontal cortex interact to enable higher executive function and memory encoding that consolidate established belief structures. These belief structures influence future emotional processing, thinking, and behavioral patterns for everyday functioning and survival if warranted with trauma. Figure 4. SIFT base model corresponding to the functions of the cingulate gyrus, dentate gyrus, and inferior temporal gyri, basal ganglia, subiculum, perirhinal cortex and prefrontal cortex. Copyright by Clear View Psychology Services Pty Ltd. The cingulate gyrus helps regulate emotions and pain. It is thought to directly drive the body’s conscious response to unpleasant experiences. It is involved in fear and the prediction (avoidance) of negative consequences, which helps orient the body away from negative stimuli. Learning to avoid and protect from negative consequences is an important feature of memory. The cingulate gyrus has been associated with pain processing, emotion memory, and self-regulation (Carter, 2009). The dentate gyrus is connected to the hippocampal formation, which has three highly interconnected regions: the dentate gyrus, CA3, and CA1. The dentate gyrus is one of the very few regions of the brain where adult neurogenesis (development of new neurons) has been found. It is known to play an important role translating complex codes from cortical areas into simpler codes that can be used by the hippocampus to form new memories (Carter, 2009). The dentate gyrus has been associated with memory formation and having a role in memory recall. Improved neurodevelopment in children has been associated with exercise during pregnancy (Clapp, 1996). The middle and inferior temporal gyri are involved in a number of cognitive processes, including semantic memory processing, language processes (middle), visual perception (inferior) and the integration of information from different senses. These structures have been implicated in recognizing and interpreting information about faces. They are part of the ventral visual pathway, which identifies “what” things are. The inferior participates in some forms of mental imagery (Schaeffer, Novaes, da Silva, Skaf, & Mendes-Neto, 2009). Overall, SIFT describes an emotional information processing framework that is both flexible and understandable by a client. SIFT has been developed to be dynamic in order to allow a client to understand the dynamics of various stages of emotional impact, pain, or traumatic processing according to neuroscience. The SIFT model can easily condense or expand its function during unpredictable therapeutic processes throughout psychological recovery. SIFT demonstrates multiple interactions between an initial acceptance or impact of emotional information (all senses) and immediate responses, consolidating information, capacity to think, behavioral shifts/adaptation to change, learning, long-term adaptation and day-to-day functioning. SIFT allows the clinician to best understand and describe to the client how initially selected environmental information is prepared and stored for further emotional processing in a more central subconscious structure, which facilitates immediate, reinforcing, motivationally rewarding and encoding systems for long-term memory structures. The SIFT base model has several structures that show how sensory information is emotionally processed, allowing the clinician to describe a range of emotional experiences—from what a person typically experiences during everyday emotional functioning through to the extremes of life-threatening traumatic events. With this model, the clinician can highlight how a client filters and rejects or accepts environmental information using all their senses simultaneously to best navigate and adjust to their world. In summary, Figures 1, 3, and 4 describe how the ISA filter (thalamus) relays information from sensory inputs into the ISA (entorhinal cortex), then on to the EPA (thalamus interaction, hippocampus, hypothalamus—if necessary in danger—and amygdala) and eventually into the LTSA (via processing of the cingulate gyrus, dentate gyrus, middle and inferior temporal gyri, basal ganglia, subiculum, perirhinal cortex, and prefrontal cortex). In turn, the ISA filter enables external environmental stimuli via the senses and the internal interplay of memories, knowledge, expectations, and experiences that form the basis of a person’s individual established belief structures. SIFT has been conceptually designed so that the counselling clinician can facilitate long-term shifts in a client’s interpreted environment and stored memories to promote positive behavioral growth. SIFT enables clinician and client to understand the processes involved in adapting to everything, from everyday emotional processing to highly distressing incidents that are complex, overwhelming, and disorganized in nature. The strength of SIFT is that it effectively corresponds with known functions of how the brain operates. This correspondence provides a sound scientific basis for facilitating, challenging, and approaching difficult psychopathology, and in turn, promoting greater adaptive positive development to combat future adversity. The SIFT model aims to describe how information is filtered, evaluated, and organized for emotional processing from established personal beliefs for future storage. It is anticipated that future research and publications will provide specific detail as to how SIFT can expand to illustrate to a client how traumatic exposure and pain radically alter the operation of the SIFT model due to the potentially life-threatening emotional impact and forced personal belief structure shifts that occur when surviving. In addition, the SIFT model allows a person who is severely traumatized and suffering pain to understand how they can re-establish day-to-day functioning. This in turn can enable long-term emotional processing, challenge unpredictable triggering, and promote stable, adaptive growth. This paper has aimed to introduce an inclusive neuropsychotherapeutic construct to facilitate better treatment outcomes for clients attempting to recover. SIFT enables both the client and their therapist to understand emotional disturbance processing, using whatever therapeutic orientation they choose, while being able to effectively describe how the brain operates under duress. The SIFT model is designed to enable the clinician to work within short- and long-term interventions that can highlight the impressive dynamics of how the brain functions. Overall, SIFT has a simple, clear, and expansive conceptual framework so individuals at different stages of emotional processing can understand and explore how they are currently progressing toward long-term recovery. Arden, J., & Linford, L. (2009). Brain-based therapy with adults: Evidence-based treatment for everyday practice. Hoboken, NJ: Wiley. Bouda, S., & Diver, S. (2012). Survival: The inspirational story of the Thredbo disaster’s sole survivor. Sydney, Australia: Macmillan. Carter, R. (2009). The brain book. London, United Kingdom: Dorling Kindersley Ltd.
Clapp, J. (1996). Morphometric and neurodevelopmental outcome at age five years of the offspring of women who continued to exercise regularly throughout pregnancy. Journal of Paediatrics, 129, 856–863. Deshmukh, S. S., & Knierim, J. J. (2011). Representation of non-spatial and spatial information in the lateral entorhinal cortex. Frontiers in Behavioral Neuroscience, 28, 5–69. Frodl, T., Meisenzahl, E. M., Zetzsche, T., Höhne, T., Banac, S., Schorr, C., . . . Möller, H. J. (2004). Hippocampal and amygdala changes in patients with major depressive disorder and healthy controls during 1-year follow-up. Journal of Clinical Psychiatry, 65, 492–499. Hjelle, L. A., & Ziegler, D. J. (1992). Personality theories: Basic assumptions, research and applications (3rd ed.). New York, NY: McGraw Hill. Prochaska, J. O. (1984). Systems of psychotherapy: A transtheoretical analysis (2nd ed.). Homewood, IL: Dorsey Press. Rossouw, P. J. (Ed.). (2014). Neuropsychotherapy: Theoretical underpinnings and clinical applications. Brisbane, Australia: Mediros. Shapiro, F. (2012). Getting past your past: Take control of your life with self-help techniques from EMDR therapy. New York, NY: Rodale Inc.
Strathis, P., Panourias, I., Themistocleous, M & Sakas, D. (2007). Connections of the basal ganglia with the limbic system: Implications for neuromodulation therapies of anxiety and affective disorders [Supplemental material]. Acta Neurochirurgica, 97, 575–586. Wilson, D. J. (2014). A new treatment for PTSD: Ross, a 65-year-old male survivor of the December 26, 2004, Indian Ocean Tsunami. In P. J. Rossouw (Ed. ), Neuropsychotherapy: Theoretical Underpinnings and Clinical Applications (pp. 291–308). Brisbane, Australia: Mediros. Van der Kolk, B. A. (1994). The body keeps the score: Memory and the evolving psychobiology of post-traumatic stress. Harvard Review of Psychiatry, 1, 253–265. The core of your writing while appearing agreeable originally, did not work very well with me personally after some time. Someplace within the sentences you managed to make me a believer but only for a very short while. I however have a problem with your jumps in logic and you would do nicely to help fill in those gaps. If you actually can accomplish that, I would surely end up being amazed.